So, you built yourself a large MP3 collection, but what use is it if you can only listen to it at home? Never fear, the solution to this vexing problem is as simple as getting yourself a portable CD-MP3 player. The only question that remains, is which one should you choose? Well first off, there seem to be as many methods of storage as there are MP3 players. One of the most creative devices I've seen is the RioVolt by SonicBlue. 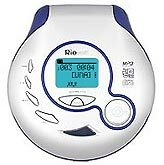 Where other MP3 players either a flashcard, embedded memory or even a 2.5" portable hard drive, the Riovolt uses CD-R's, and even better yet, CD-RW's. And yes, it also plays regular CD's, which still have their place in the great scheme of things. Cost is about $300 CDN. The RioVolt CD-MP3 player comes with a pretty basic instruction manual. It's just a picture of the player and captions pointing out what each of the buttons does. Still, it should be enough info for anyone to figure out how to use the unit. The player also comes equiped with a protective carry case, AC adapter, earphones and remote control. It was nice to see the RioVolt come with a pair of AA batteries as well. SonicBlue ship their RioVolt with some bundled software of the following description; Real Networks audio management software and Adaptec CD burning software for use on the PC and Mac. The RioVolt reads standard audio CD's, the CD-R's and CD-RW discs. It can recognize MP3 and WMA audio files and the firmware can be upgraded as new formats are released. It also features a large back lit LCD screen that displays ID3 tag or CD audio text. For those of you who like to jump around, 120 seconds of shock protection are at your fingertips, as well as a large variety of play list options. The RioVolt has a line-out jack and hold key for safely storing it away. With each firmware upgrade, new software functions can be added. The RioVolt's remote and headphones. Unlike other MP3 players that rely on some kind of transfer cable (USB or serial), you must have a CD burner to use the RioVolt. Since most computer savvy people have CD burners these days, this shouldn't be a problem for the majority of people. The RioVolt is able to read CD-R's and CD-RW's, thereby letting you store music in MP3 format on the disk. Usually I'm able to get about 10 to 12 hours of compressed music on each disc, but this will depend on the quality of encoding you go with. Whatever the case, that is a lot of music! Since the RioVolt is able to read CD-RW's, you have the potential to constantly change your selection without constantly spending money. Buy one or two CD-RW's and you're good to go for hours on end. Since the number of CD's you can burn is unlimited, there really is no practical limit to the volume MP3's you can take with you.